Barça B were able to qualify for the final knockout round to decide who is promoted to Division 2B even though they lost the return leg against Cartagena 1-0. The blaugranas’ 2-1 victory in the first leg saw them through and they are now a step closer to promotion. The game was very even and the blaugranas managed the match well when the opposition took the lead from the penalty spot. There were almost 5,000 fans at the Mini Estadi including the Vice-Presidents Jordi Cardoner and Jordi Mestre and the first team player Sergi Samper. The blaugranas started with the intention of securing their place in the final knockout round. Both sides looked to play the ball and pressed high up the pitch. The first effort of the match was saved by Suárez in the eight minute and the blaugranas responded soon after with a powerful Gumbau effort from outside the box palmed away by Limones. The clearest chances came after half an hour had gone by when Palència cleared Cristo Martín’s effort off the line. Once again, Gerard López’s side responded with Perea going close from an Aleñà pass on the counter attack. 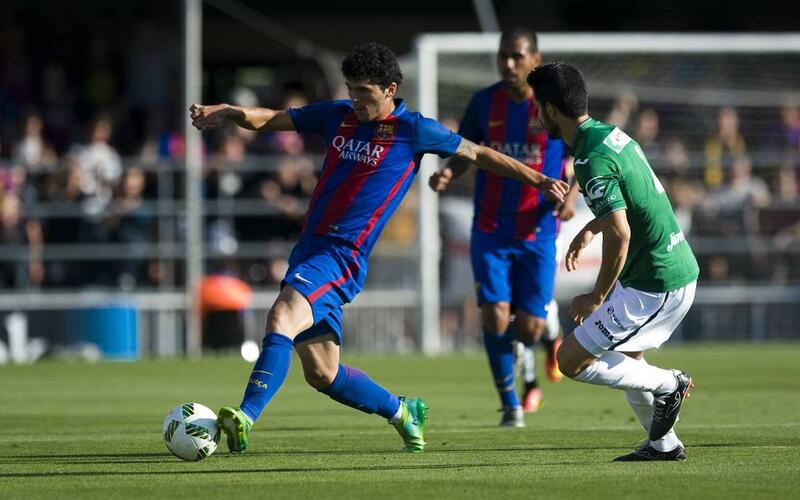 The second half started with a change up front for Barça as Dani Romera came on for Perea. The dynamic was much the same as the first half and Gumbau tried his luck from distance again. Both sides made inroads into the opposition third but neither were able to convert the chances they had. Gerard López’s side also suffered the setback of March Cardona’s injury in the 66th minute which saw him replaced by Carbonell. The match was tense and there was nothing in it until the referee blew for a penalty in the 78th minute. Palència fouled Sergio Garcia and he picked himself up and converted the spot kick himself. For the final ten minutes Barça needed to protect their aggregate lead and the did so perfectly in a complicated situation. In the end, the first leg win was enough to see them sneak past Cartagena into the final knockout round as they look to get promoted to Division 2B.